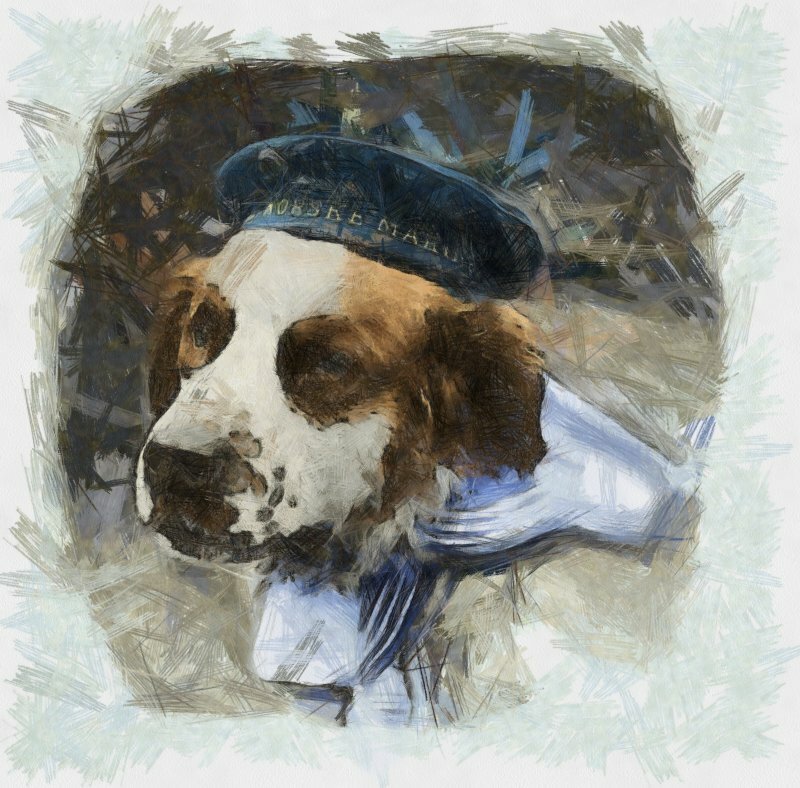 Bamse was born to be a seadog, and was named after the Norwegian word for ‘Teddy-bear’. His owner was the Captain of the whale catcher Thorodd, and was used to sea-going life from an early age. Due to the beginning of the Second World War, the Throdd was conscripted as a coastal patrol vessel by the Royal Norweigan Navy. Shortly before the complete Nazi occupation of Norway, the Throdd was able to escape to the United Kingdom. By this time, Bamse had already been enrolled as an official member of the crew. The Thorodd was converted into a minesweeper, and Bamse had a vital role. During battle, Bamse would stand on the front gun tower of the boat, as if guiding his troops. The crew decided to make Bamse a special metal helmet he could wear into such battles. Bamse had a strong strong sense of responsibility, and appeared to take on the role of ship security. Not only did he take on the task of ensuring the crew’s safety (he once pushed a knife-wielding assailant into the sea to stop them attacking a young Lieutenant Commander), but he would also break up fights by jumping up and putting his large paws onto the shoulders, claiming them down and leading them back to the Thorodd. He was also responsible for dragging a young sailor who had fallen overboard, back to safety. During his time in Scotland, Bamse took it upon himself to ensure the crew were present and correct if they went missing. He was well known for rounding up the crew in time for duty. This was no small task – he would take the local buses into Dundee, find the crew and bring them back again. So accomplished at this, Bamse was unaccompanied on these trips, and so the crew bought him his own buss pass, which hung from his collar. On the occassions he could not locate his crew, he would take the return trip back to base – no doubt he didn’t want to fall foul of the curfew. Due to his bravery and impressive sense of professionalism, Bamse first was awarded the honour of becoming the mascot of the Royal Norwegian Navy. It was probably inevitable that he also become the mascot of all the Free Norwegian Forces. On the 22nd of July 1944, Bamse died on the docks at Montrose of heart failure. Such was his effect on the his naval comrades, Bamse was buried with full military honours. According to reports, hundreds of servicemen, sailors, and local residents of Dundee and Montrose of all ages attended his funeral. Even to this day, the Royal Norwegian Navy holds a commemorative ceremony every ten years. In 2006 HRH The Duke of York unveiled a bronze statue of Bamse, crafted by Scottish sculptor Alan Herriot. Sources seem unclear as to whether Bamse was a male or female, but his official website describes him as male, although other sources believe from photographs, that ‘he’ was a ‘she’. Whatever gender, there’s no argument that Bamse was a big, brave dog with a huge heart.